I wrote the book on Michigan expungement. I help hundreds of clients each year better understand their eligibility, and help many of these people clear their criminal record. For an expungement, I typically charge between $2,000-$3,000. The clients that hire me want a full-service approach, and want a professional to get the job done. Expungements are very complicated with deadlines, timelines and many entities to provide notice. You also need to face multiple prosecutors and the judge when you go to court. Not easy. Over the years, I have had to pass on too many cases, because the client simply did not have the money to hire me. This is a tough, but necessary business decision for me, but it never felt great. Because I have had to turn down literally 1,000's of potential expungement clients, I decided to create a more affordable option. 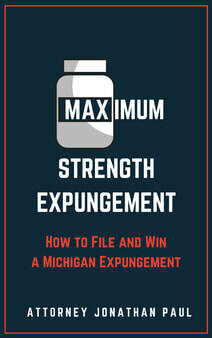 My book, Maximum Strength Expungement - How to File & Win Michigan Expungements walks the reader through whether they are eligible, and if they are not sure, how to be sure. I explain the process from A to Z from the simple goal of expungement to the judge signing the order to expunge the charge(s). I then go beyond the nuts and bolts of expungement, and explain many of my secrets and insider tips for how I make the client's application even stronger. I set the price at $100, which is not cheap, but it's $2,900 cheaper than hiring me to work on the expungement for the client. The book is meant to educate the client, and give them an option of doing it themselves, or hiring me. If they want to hire me, I will offer a discount to someone who has already purchased my book, so in the end it's even more affordable for that client. If you're interested in purchasing the book and deciding if you want to do this yourself, click on the photo of the book on the right-hand side of this page, and you will be taken to Amazon.com to finalize your purchase. If you would prefer to reach out to me first, and tell me more about your case, please go ahead and fill out the contact from on the right-side of this page, and I will do my best to respond and answer your questions.